The C.R. 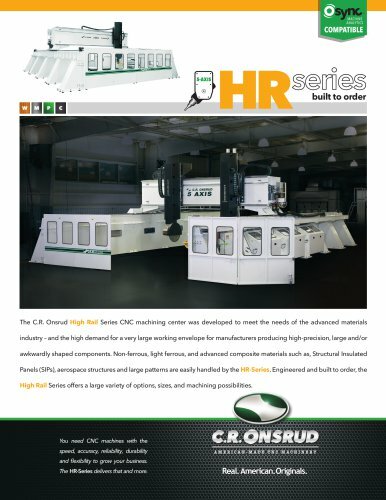 Onsrud High Rail Series CNC machining center was developed to meet the needs of the advanced materials industry – and the high demand for a very large working envelope for manufacturers producing high-precision, large and/or awkwardly shaped components. Non-ferrous, light ferrous, and advanced composite materials such as, Structural Insulated Panels (SIPs), aerospace structures and large patterns are easily handled by the HR-Series. Engineered and built to order, the High Rail Series offers a large variety of options, sizes, and machining possibilities. You need CNC machines with the speed, accuracy, reliability, durability and flexibility to grow your business. The HR-Series delivers that and more.